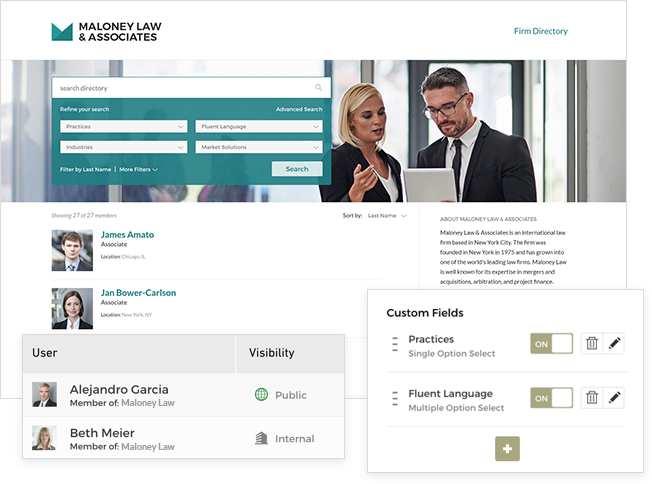 Workfolio Directory includes customizable profile sections and powerful search options to find the people with the expertise you are looking for. Workfolio Directory helps you stand out to clients and prospects by engaging them with your team profiles and capabilities like never before. Workfolio Directory gives you complete control over administrative rights, profile change approvals, and other permissions. A modern platform that powers your public, client-facing, or internal Directories in a single, highly-affordable, customizable solution. Profiles that are flexible and easy to maintain with optional content governance features for peace of mind. Customizable microsites, specially designed for presentation to clients, which improve engagement and separate your firm from the competition. 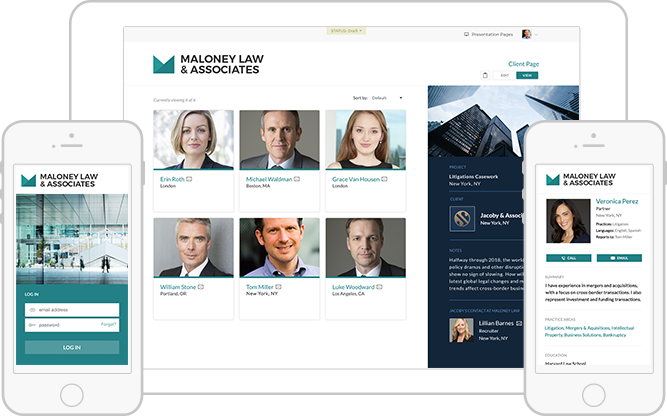 View your Directory and Client Pages with a responsive interface accessible from any desktop, tablet, or mobile device. Enjoy the ease of included multi-site cloud server deployments, enterprise-class security, and automated data backups. Make your Directory a part of your organization with extensive branding options such as logos, banners, domains, and accent colors. Set roles and unlimited member groups for each of your administrators to fit the structure of your organization. Seamlessly connect your Directory to your organization's websites, intranets, HRIS, and other applications. Bring the capabilities of your Directory to the next level by working directly with the Workfolio team for special requests. 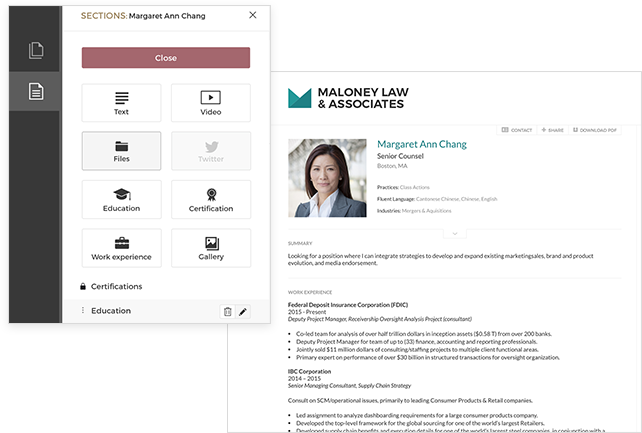 Showcase your firm's work to potential clients by integrating with our upcoming Case Studies application. of people think it is important to find professional background information about a provider before choosing them. of people would not fully trust a provider whose directory profile information appears to be incomplete or out of date. of people’s purchase decisions are influenced by the information they find about a provider. "Workfolio Directory greatly enhances our client experience and is a powerful differentiator for us in the market." Can I keep the existing directory on my website? Yes! 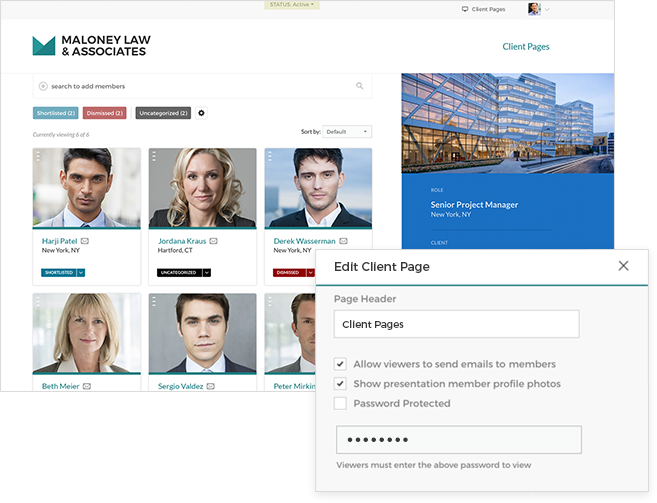 Our user interface has been carefully designed to be the public face of your directory, or you can instead let us power the directory on your website behind the scenes via our API. Any changes made to your members' profiles in Workfolio Directory will automatically be reflected on your website. Workfolio Directory was built to allow employees to make changes themselves, reducing the overhead required to keep their profiles current, and administrators can also make changes to employee profiles. You may optionally configure your Directory so that all content changes require administrator approval before being published. Yes! We offer a 20% discount to non-profit institutions. To request the non-profit discount, reach out to us with a link to your organization's website. Yes we do! We offer a special 10% discount for annual subscriptions for Workfolio Directory. To request this specifically, please contact us using our contact form at the bottom of this page. Ready to transform your directory? With our guided setup, you'll be saving costs and winning more business.